Daphne Collingham is masquerading as a governess in Lord Timothy Colton’s home – determined to discover if he is responsible for her beloved cousin’s death. She’s prepared to uncover secrets and scandal, but the biggest revelation is the way she feels under the lord’s dark gaze…. 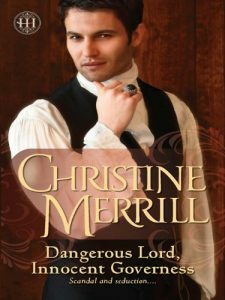 Lord Colton is suspicious of the alluring new governess – and with the furor surrounding him he must control his passion. But a man has his limits, and the delectable Miss Collingham is pure temptation….